CHICAGO (AP) -- Dustin Byfuglien looks like a middle linebacker on hockey skates. At 6-foot-3, 247 pounds, the Chicago Blackhawks' right wing is stirring up the Western Conference semifinals with his physical play -- a lot of it right in front of the net. "Anytime he runs into somebody or somebody runs into him, it's usually a big hit," teammate Patrick Sharp says. "He's been a force so far. We've got to do a better job with him," Vancouver defenseman Kevin Bieksa said. "He's a big body." Byfuglien's ability to create traffic in the crease could be a big factor Tuesday night when Chicago returns home to face the Canucks in Game 3 with the series tied at 1-1. Byfuglien crashed into Vancouver's Roberto Luongo during Chicago's 6-3 victory Saturday night. Byfuglien had been hooked on the play for a penalty, and his momentum sent him right into the Canucks' captain and star goaltender. "I think he lost his edge on the play, so I don't think it was intentional," Luongo said. When he's in the game, Byfuglien wants to get in Luongo's way and get his attention, maybe even start a conversation. Chicago had five goals against Luongo on Saturday night -- the same number he allowed in a first-round sweep of St. Louis -- and also scored an empty netter. "I feel I had to step in and play physical, get some bodies in traffic in front of Luongo," Byfuglien said Monday after practice. "He's a big guy. If he sees the pucks, he's going to stop them. Someone has to get there and get in his head. ... A little talk went back and forth. It's all part of the game and we're just having fun." Losing a 3-0 lead in Game 1 before rallying for a 5-3 win and then squandering a 2-0 advantage in Game 2 was no fun for the Canucks. And now they'll be without their versatile defenseman Sami Salo, who has three goals in the postseason. He was hurt after scoring on a power play Saturday. "For sure not tomorrow," coach Alain Vigneault said of Salo. 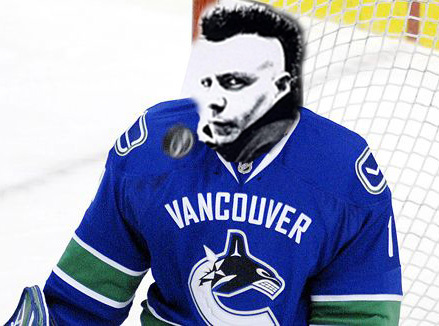 Vancouver right wing Pavol Demitra is also iffy with an undisclosed injury. 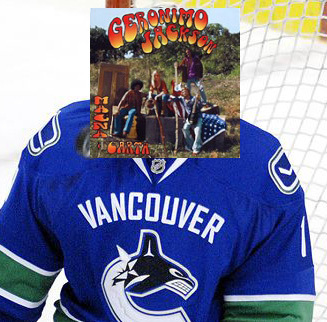 Luongo said he's not distracted by the trash talk or Byfuglien's attempts to keep him from seeing the puck. "He's a big guy who likes to screen me, but that's part of the challenge," Luongo said. "I haven't done much talking at all, more looking. He likes it. I don't mind it all." Chicago coach Joel Quenneville said the 24-year-old Byfuglien started to pick up his game late in the regular season and it's carried over into Chicago's first playoff appearance in seven years. "When he gets in front of the net, that's tough to look around," Quenneville said. "They're aware when he's out there. (But) He's being more than just being a body in front of the net, he can do things with the puck as well." Byfuglien has a goal and three assists in eight playoffs games so far, not necessarily a measure of his contributions. "I'm just a guy who goes out there to do his job and get it over with, go back to the bench and wait for the next shift," he said. Chicago gained control of Game 2 with its speed and good play from defenseman like Duncan Keith, Brent Seabrook and Brian Campbell, who were able to stop the Canucks' and then get the puck moving the other way. "They're a good team with their skill and transition," Vigneault said. They've been the better team 5-on-5. We need to make higher percentage plays on the ice. If we do that, I think we'll be in good shape." I'm feeling a win for the Nucks! Go Hawks! Very exciting young team, a lot of fun to watch! GET THOSE BEERS ON ICE!!!!! shabbs wrote: GET THOSE BEERS ON ICE!!!!! shabbs wrote: I'm feeling a win for the Nucks! The Canucks discovered the hard way that no lead is safe against the energetic Blackhawks. In Game 1, the Canucks blew a 3-0 lead but managed to squeak out a 5-3 victory. In Game 2 they couldn't hold an early 2-0 lead and were steamrolled by the opportunistic 'Hawks, who took control of the game in the second period to crush the Canucks 6-3 and tie the series. It's not the first time the Blackhawks rallied from a seemingly insurmountable deficit in this year's playoffs; they overcame two- and three-goal deficits against the Calgary Flames. Blowing big leads was an unfamiliar situation for the Canucks, having had an easy time of it with a young, inexperienced St. Louis Blues team. The Blackhawks' roster is also filled with young players lacking playoff experience but unlike the Blues, the Blackhawks youngsters — notably Patrick Kane, Kris Versteeg, Jonathan Toews, Cam Barker, Brent Seabrook and Dustin Byfuglien — have adjusted to the pace of postseason hockey. That was painfully obvious to the Canucks in Game 2. If the Canucks were guilty, as some have suggested, of taking the Blackhawks lightly after Game 1, their lopsided loss in Game 2 should be a wake-up call. No more blown leads. This is where Bl remembers that the C stands for a little more than Canucks. He's got to lead by example and *not* give up 3 goals in a period, period!